It's not enough that birds are dropping from the skies and fish are washing up on our shores...now we've got disappearing bumblebees to contend with. Some American bumblebee species saw a massive 96% population drop in the last 20 years. The United States is home to fifty bumblebee species, and researchers at the University of Illinois examined eight of them. They discovered that half of the species they examined declined an average of 96% in total abundance, and now occupy just 13% of their previous geographic range. The bumblebee deaths may or may not be related to the ongoing colony collapse phenomenon that is affecting honeybees. "That certainly could impact the efficiency of our food production for many crops, such as cranberries, blueberries, tomatoes. 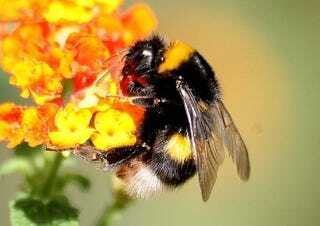 Bumble bees are especially good pollinators of these types of crops." We do know that the dying bumblebee species have significantly less genetic diversity than their healthy counterparts, and the researchers speculate North American queen bees brought back a deadly parasite from Europe, as some queens were transplanted to special rearing facilities there when their species became endangered. Still, there's a lot that we don't know about what's going on here, but like the birds and the fish, we're sure there's a perfectly rational explanation for all this. Well...96% sure, at any rate.